You can space your holes in any way--although I tend to keep mine no more than 1" inch to 1 1/4" inches apart. You can also take all the measurement guess work out of the way by simply using a border punch to get the holes all evenly spaced out. For this layout I used Martha Stewarts Scallop Dot punch. I then inserted black eyelets into the holes with my Crop-a-dile. Step 1: Start by stringing your ribbon or twine straight across in the 2nd from last holes at the bottom. 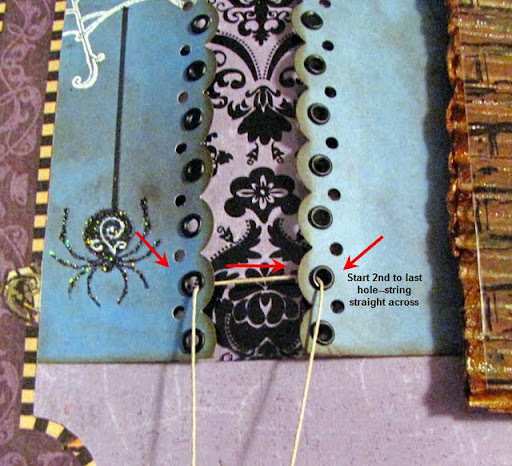 Step 2: Take your string straight down & insert into the last set of holes. Step 3: Bring your string up & criss cross them. Have the ends emerge from underneath the next empty set of holes. Step 4: Bring your string straight down & loop it underneath the existing lacing in the next lower set of holes. Make sure you do this on both sides. 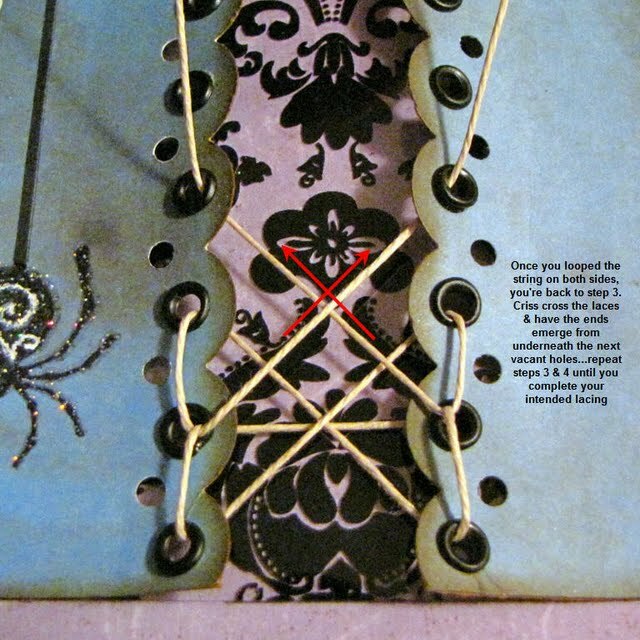 Step 5: Once you've looped your string on both sides, you're back to step 3 again. 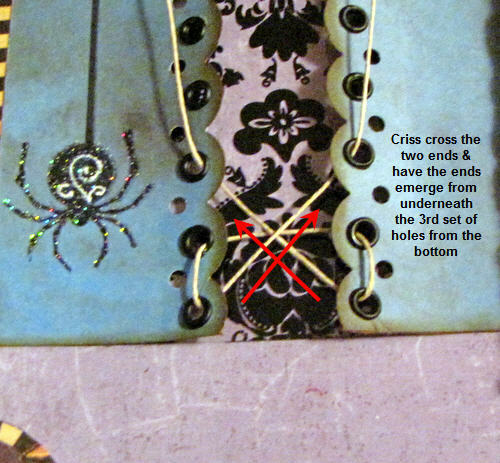 Bring your strings up, criss cross them & have them emerge from the next set of empty holes. Repeat steps 3 & 4 until your lacing is complete. Here you have it! One spider lacing complete. 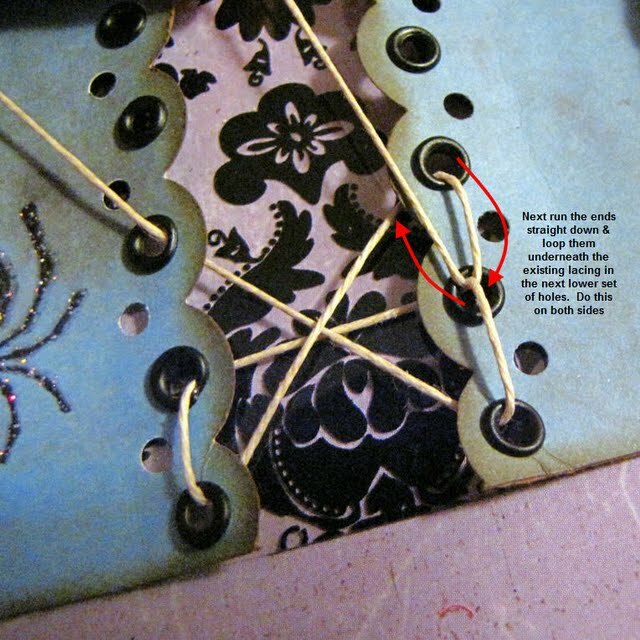 Hope you enjoyed this brief lacing tutorial. 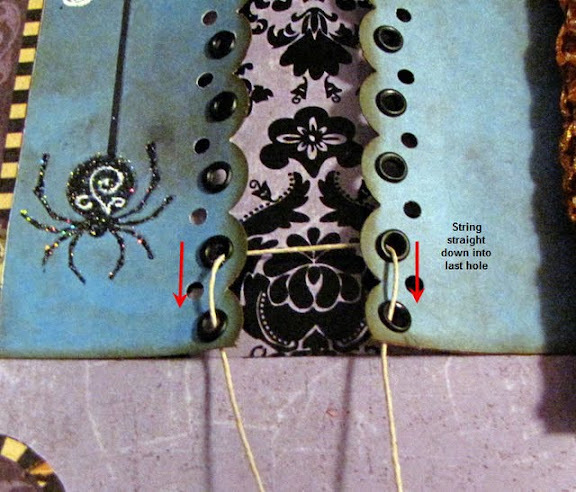 What a wonderful lacing technique! Thanks so much for sharing how you did it! This is so awesome!!! Love it!! This is so cool...and you made it so easy. Love it. Will try it sometime soon.